How many times do you hear “there’s so much to be done, and we have not even touched the iceberg yet” when people plan their weddings? Whether it is finalizing the venue or, the dress rehearsals, you are always short of time, and the list seems to grow longer. Getting RSVP from the guests, making sure the food will be served on time, and finally getting together to book a photographer, everything requires proper planning. It can become quite exhausting. How do you wish you had a magic wand that would suddenly make all the difficulties that you experience with planning disappear? Wedding planning apps are the new age way of managing the different chores related to your wedding. From organizing to meeting the vendors, the apps are all developed to offer you the solace. Today, the app world has transformed in a way that they don’t just serve you with millions of inspirations, but also offer help with carrying out the multiple tasks. Apps like Zola and WeddingWire are topping the list of most used wedding apps, as they offer convenience to the couple planning the whole event. 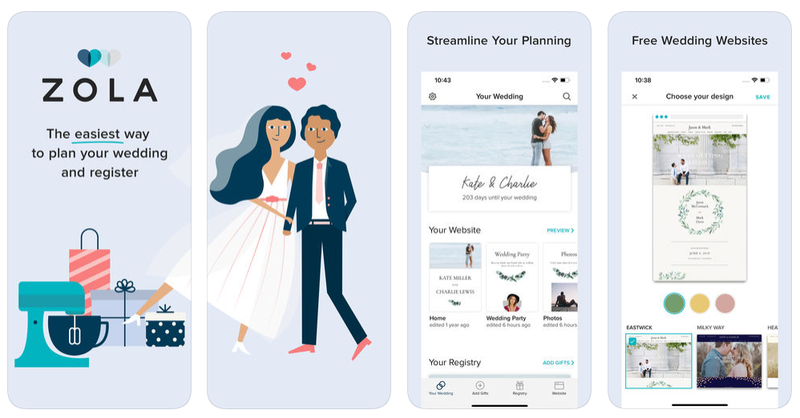 Before we begin with what you should include when developing the wedding planning apps, let’s get to know the apps Zola and WeddingWire, and what they aim to offer the audience. Wedding registry is an important part of your wedding planning. Now, you can get your registry done using the app Zola. The app uses a combination of the brick and mortar stores as well as Blue Apron services to help you create the wedding registry. The other wedding app that we will talk about here is the WeddingWire. It helps you in your search for the right event organizers. Imagine, how difficult it was to connect with someone who was both reliable and trustworthy and handing over the entire wedding task to them? With this app, you not only get to meet a wide range of planners but also know whether you can trust them or not. With a zillion reviews following them and a database of over 2,50,000 event professionals, you can easily make the choice that matches your needs. Apart from helping you meet the event professionals, the app also helps you track the to-do list and customize the budget tools. With these two apps, you have an idea of what you are looking at, and what you need to develop if you are planning a wedding planning app to simplify the lives of the couples. There are a few steps that will help you get to the wedding planning app idea, and even execute it. Let’s go step-by-step with the development of a planning app. What type of app will do justice to the solution you have in mind? What do you plan to offer the audience with the app? There are majorly four wedding app types that you can consider when planning to develop one for the app store. »The planning app allows the couples or the organizers include all the tasks involved with planning with a deadline. There are various types of planning apps that you can develop, each one matching up to a niche needs. »The countdown apps are quite popular with the couples. This can help the couple share the countdown with their people on social channels. It is all about creativity, wherein you need to pull out incredible backgrounds and match it with the creative that you are planning. »The checklist app is the most essential kind for the audience. The checklist helps with every single task. For instance, you are planning the guest list for the wedding. The checklist app will allow you to enter all the people on the list. You can mark if you have sent them the invite, whether they have sent the RSVP and other details in the app. This will keep you updated with the lists that you have created. This app is particularly important if you have several tasks on your plate, and you are not sure which one is done and which ones are yet to be done. »The guest list app is a defined niche, which is particularly defined for tracking invites sent to the guests and knowing if the guests at the wedding are among the invitees only or not. There are QR code functions in some of the guest list apps that allow you to send badges to the guests so as to identify the guests at the wedding. This helps prevent all sorts of confusion. » Payment integration: Paying up online for the various e-commerce purchases can prove to be easy and hassle-free for the audience. It is important that the different wallets and payment methods are integrated into the application you are developing. » Gallery: If the planner wants to put up an idea in front of the couple or the couple wants to give an idea as to what they want for the wedding, then the gallery is the source for both. You can easily share the designs related to event themes, hairstyles and other related things with the planner or supplier or the vendor through the app. » Social media integration: If you want to develop a countdown app, then social media integration is very important. It allows you to share the countdown with the different people on your list and keeps the excitement high. Apart from the countdown apps, there are several others that require social media integration from you. » Budget Calculator: As a couple, your main interest is whether or not you are going overboard with your budget. In this case, the budget calculator would be an interesting addition to your wedding planning app. You can easily know the budget that you have in hand and the total budget of the wedding that you are planning. It will also help you know what you need to cut down on. » Checklist: When you are developing a wedding planning app, you should ideally have a checklist feature included in the app. It will help you know what tasks are done, and what is yet to be completed. Apart from these user-centric features, you should have two admin features that are important for the better usage of the app. » CRM Integration: If you are a wedding planning company that manages several customers, from actual ones to the potential ones, you need to have the CRM integrated to your app. It will help you keep up with the customer requirements and allow you to connect with the dormant customers. » CMS Integration: If you want to make changes to the static pages of your application, then it is important you have the CMS integrated to your application. It will help make the changes on the go. Once you have defined the features and the type of app you are planning to develop, make sure you have validated the cost of developing the application. The cost of the application depends on the basic and advanced features that you want to include in the application. Each feature will cost you some part of the development cost. Apart from that, you need to factor in the platform for which you will develop the app, the APIs that you will integrate and the complexity of the application before calculating the cost of the application. The cost of the application will also include the total number of hours invested in developing the application. Have a new wedding planning app idea in mind? Consider all the factors that we have listed out in here, and make sure you plan accordingly. Every step must be calculated before you conclude on the project. The execution of the app development will become easy once the blueprint for the strategy is ready and you know what you aim to achieve with the app. If you need help with the app strategy or, you just have an app idea that needs further elaboration, connect with us at Coruscate. We will help deliver an aesthetic and functional app with maximum assistance, based on your app idea.